I have only seen one other piece by Zesk, and it is the rather lovely work on the side of the Three Tuns pub in Partition Street, near my work. This Burner contains many of the characteristics of Zesk’s work, including the stars and the colours, shading and black spots used. I guess the biggest give away though is that it says ‘Zesk’ in big letters. This is a nice piece by a great artist. It is good to see that someone who is accustomed to doing commissions, still hits the areas where street art is tolerated rather than permitted (another way of saying not strictly legal). Another lovely piece from the extraordinary outdoor gallery, AKA Devon Road. This cat in a deckchair is by one of the godfathers of Bristol street art – Rowdy, and contains all his hallmarks, as you can see from looking at this previous post. I think that there is at least one other artist involved in this piece, but somewhat disconnected from our feline friend. I am not sure who the artist is. 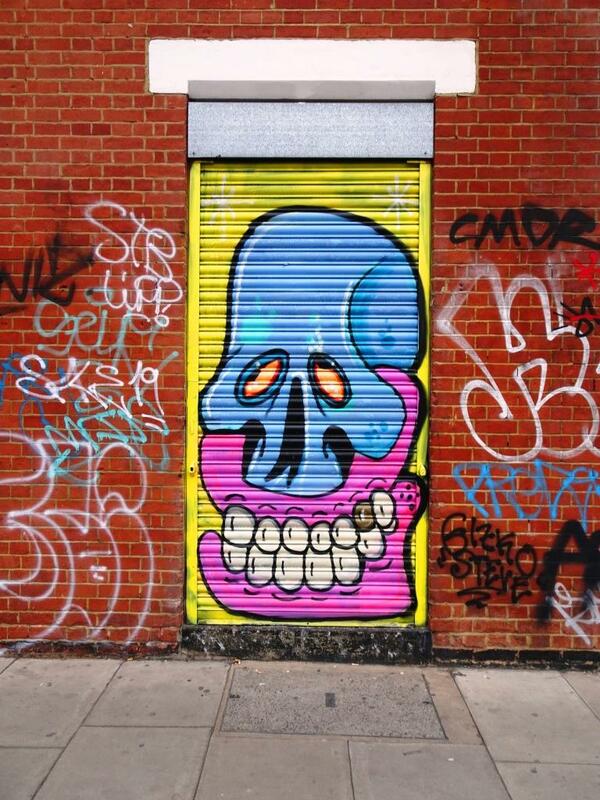 There is something wonderfully laid back and ‘Bristol’ about the work of Rowdy. Highly accomplished, distinctive, relaxed and mildly anarchic – great stuff. There was one final gift for Bristolians that Shalak Attack and Bruno Smoky (Clandestinos) left behind on their recent trip to Bristol…this brilliantly colourful masked face. This was another surprise for me in Wilder Street, an area which is now firmly on my routine street art patrols. There is something of acarnival feel to this piece, and it has an unmistakably South American touch. I still feel privileged that Clandestinos came to Bristol and left these remarkable pieces, however the story is not all good I’m afraid. The piece I wrote about by Shalak Attack in Stokes Croft has been tagged with a rather poor ‘throw up’. The great piece next to it by SPZero76 and Mr Wigz has similarly been defaced. For less than a week, all five arches of the Carriageworks had clean untagged pieces in them…a first since I have been writing these posts. No longer. It is the nature of the beast I’m afraid, but disappointing nonetheless. This has been a mystery for far too long, but yesterday I cracked it. This fantastic piece, and genuinely one of my absolute favourites, is a collaboration by Tom Deams (Deamze) – more about him in his rather excellent website – and Georgina Anton, a Bristol-based artist with early roots in graffiti. Her biography can be found here. There is something so clean and soothing about this burner. The proportions are fantastic, the lettering wonderful, the word ‘utopia’ just seems to work and the design filling the letters is beautiful. It was unsigned, and so it has been very hard to identify. It was only yesterday that I caught a glimpse of the piece in Deamze’s portfolio that I was able to find out more. The piece has long since gone, but at least I can now sleep easy at night. Another wonderful pasteup from the recent visit by Tian. Again he has taken a still (a promotional shot?) from a film, which I haven’t been able to identify yet (any ideas?) and turned it into a monochrome stunner. As always, location is key to a wheatpaster’s art, and this is no exception, it looks splendid amongst all the other posters on this wall. The council worker ripped off loads of posters, but thankfully left this Tian piece in situ. It was still there yesterday.